Many doctors agree that the government’s attempt in the last decade to improve healthcare has actually done the opposite. Take for instance the Tax Relief and Health Care Act of 2006. It resulted in bigger stacks of paperwork and an unprecedented amount of time spent entering data. This increased administrative costs for both hospitals and independent practices, and most importantly, it reduced doctors’ ability to either spend more time with patients or see more patients per day. Not to mention, there’s already a physician shortage. And as we are aware, a slow process is usually an expensive process. Fast forward a few years and you have Obamacare, a healthcare reform that requested additional box checking, so needless to say, the stacks of paper grew taller. In fact, a 2016 Health Affairs study showed that physician practices in just four specialties (cardiology, orthopedics, family medicine and internal medicine) spent $15.4 billion annually to comply with quality measure reporting. This translated to roughly $40,000 per physician—money that could have improved patient care through investment in medical technology or perhaps nicer TVs for waiting areas. The Robert Graham Center for Policy Studies in Family Medicine & Primary Care reports that in a census of approximately 3,000 graduating family medicine residents, 58% had accumulated more than $150,000 in educational debt. Although this figure is lower than that of new residents in general ($183,000), family physicians top the list on those still dealing with the liability, according to a recent Medscape survey. 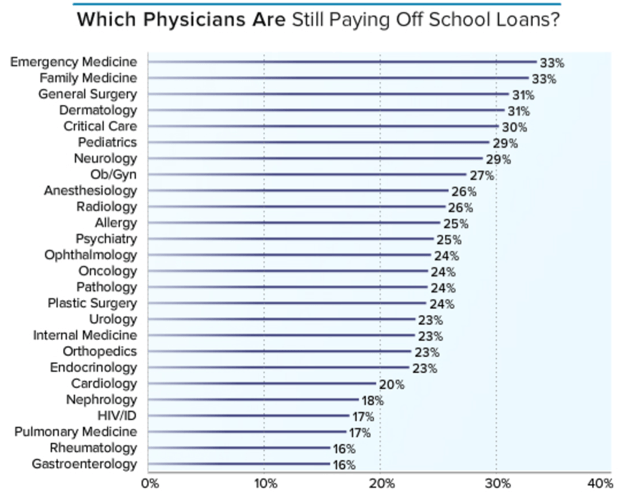 In addition, mortgage on primary residences topped the list on the 2016 Medscape Physician Debt Network Report, covering two thirds (67%) of doctors nationwide. Car loan payments followed with 38%, trailed by student loans and college tuition, which gathered approximately 30% and 21% of doctors, respectively. This list also featured car lease payments, private schools for children and mortgages on second homes; all ranging between 20-15%. At the end of the list: paying off student loans for a significant other and paying tuition for kids’ graduate schools. These final items affected under 15% of the almost 20,000 physicians surveyed nationwide across 26 specialties. 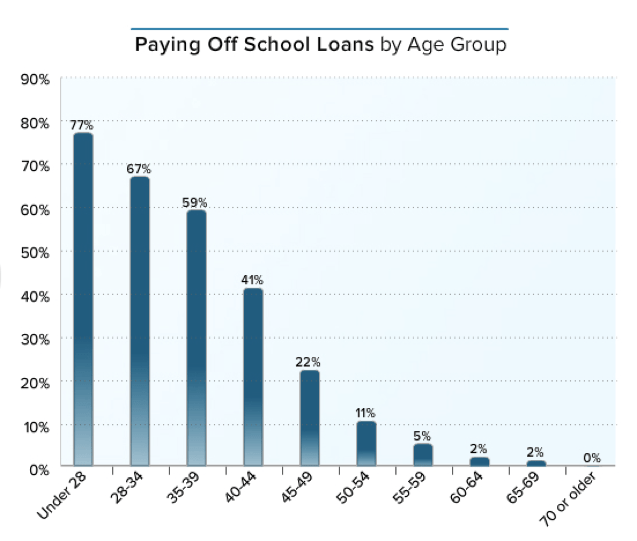 Evidently, student loans will fall steadily as doctors age, and most will finally be done paying them off during their mid 40’s. Meanwhile, the AAMC reported that medical school debt has escalated by 6.3% since 1992 compared with a 2.5% increase in the Consumer Price Index. They also reported that the average cost to attend a 4-year med school was roughly $280,000 for private schools and a bit over $200,000 for public schools. With these high tuitions, resident debt has outpaced inflation and resident compensation. As we mentioned in A look into the future of young doctors, student loan debt can be accompanied by sky-high interest rates, and in some cases, little opportunity to refinance. Lastly, the Medscape survey revealed that 20% of physicians 50 and older are still carrying this burden. Luckily for some doctors, more and more hospitals in rural America are starting to pay off student loans, as a way to sweeten up the deal for physicians who would preferably go to metropolitan areas. You’ll obviously find pros and cons whether you choose to set up your own shop or sign with a hospital. By the way, if you’re still undecided on that matter you might want to read our blog: Should I go independent? Let’s say you decide to run your own practice or partner up with a few colleagues. You’ll have to carry your average startup costs, such as initial fees for registering a small business (trademarks and such), malpractice insurance, renting or leasing an office space—hopefully where you don’t need to make significant improvements or renovations. Then of course, you need to purchase basic office equipment and furnishing, do some sales and marketing, and last but not least, retain a good accountant, tax and legal advisor. Don’t let this “expense” talk get to you. Remember earlier when we mentioned that doctors are amongst the highest paid individuals in the country? Then breathe… you’re good for it. Just keep up the good work! On that subject, it is fundamental to rely on the right Individual Disability Income Insurance Plan in the unfortunate case you are unable to practice medicine. We’ll be happy to help you achieve that peace of mind. In conclusion, the best advice we can give you is to make peace with carrying debt during your career while remembering to live within your means and make educated financial decisions. Again, we can’t stress enough how important it is to sit with a financial advisor, which is one of 5 Ways Family Physicians Can Improve Their Financial Security. After reading this, tell us what is the expense that has you most worried about today or in the future?